If you have been following my blog in recent months (or even if you haven’t–here comes the spoiler), you’ll know that I have been going slightly cray-cray lately studying for my qualifying exams. Which are coming up very, very soon. As in January soon. And if you have ever been through a period in your life when you’ve gone cray-cray crawfish style, you’ll know that you just don’t have time, the emotional capacity, or the sanity for the big heart-sinker: FAILED DESSERTS. So of course I was uber-excited when I came across this no-bake, utterly fail-proof tiramisu recipe from America’s Test Kitchen. ^ Seriously. What the photo said. But back to this tiramisu. I told you not to click away, and here is the big reason. 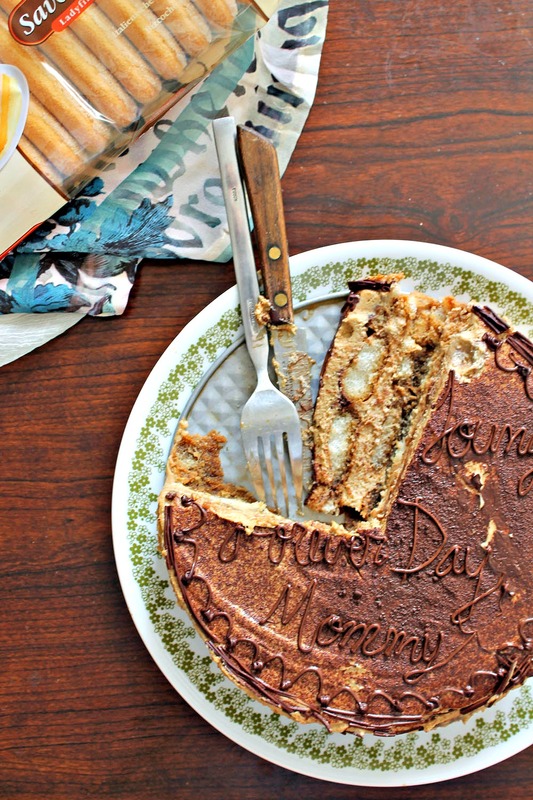 This is not only the very best tiramisu I have ever eaten, or made, or served. It has received the ultra-rare, more-elusive-than-Atlantis Mommy Stamp of Approval. Which is basically like if a scientist walked up to you today and proved that dodo birds aren’t really extinct. IT’S REALLY MIND-BLOWING. This coming from the lady who is assured that all I do in the kitchen is spawn devil pups all day, Or something. I mean, what ELSE could I be doing in the kitchen that could make it “so so so messy,” right? Just kidding. I love you, Mom! I got my forks. And I got my stretchy sweatpants on. Check, and check. 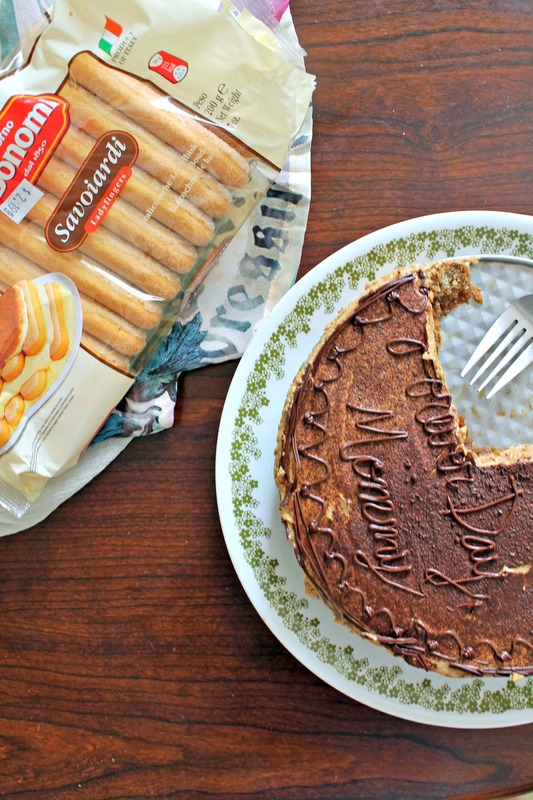 Now go do yourself a favor and go make this tiramisu. And then make sure you stop by the post office to pick up a box big enough to hold a cooler and this cake. I will even offer to pay for postage, if you get my drift. Heh. 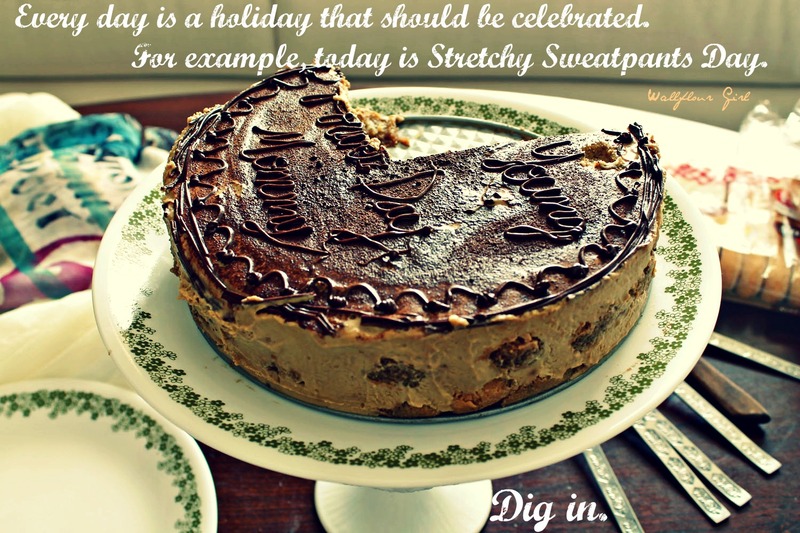 Happy Stretchy Sweatpants Tiramisu Day, every day! Original recipe below from America’s Test Kitchen. Alterations to the recipe or comments made by me are indicated in blue. 1-1/2 Tablespoons instant espresso granules–I had instant coffee granules on hand and used about 4 tablespoons of that instead. 9 tablespoons dark rum–I added about a tablespoon or two extra Kahlua in step 2. 14 ounces (42 to 60, depending on size) dried ladyfingers (savoiardi)–note: you will want to buy the hard variety of ladyfingers. 1. Stir coffee, espresso, and 5 tablespoons rum in a wide bowl or baking dish until espresso dissolves; set aside. 2. In bowl of standing mixer fitted with whisk attachment, beat yolks at low speed until just combined. Add sugar and salt and beat at medium-high speed until pale yellow, 1-1/2 to 2 minutes, scraping down bowl with rubber spatula once or twice. Add remaining 4 tablespoons rum and beat at medium speed until just combined, 20 to 30 seconds; scrape bowl. Add mascarpone and beat at medium speed until no lumps remain, 30 to 45 seconds, scraping down bowl once or twice. Transfer mixture to large bowl and set aside. 3. In now-empty mixer bowl (no need to clean bowl), beat cream at medium speed until frothy, 1 to 1-1/2 minutes. Increase speed to high and continue to beat until cream holds stiff peaks, 1 to 1-1/2 minutes longer. Using rubber spatula, fold one-third of whipped cream into mascarpone mixture to lighten, then gently fold in remaining whipped cream until no white streaks remain. Set mascarpone mixture aside. 4. Working one at a time, drop half of ladyfingers into coffee mixture, roll, remove and transfer to 13 by 9-inch glass or ceramic baking dish–I used one 9×9-inch springform baking pan (it makes for a great appearance) and one 4×6-inch casserole dish. (Do not submerge ladyfingers in coffee mixture; entire process should take no longer than 2 to 3 seconds for each cookie.) 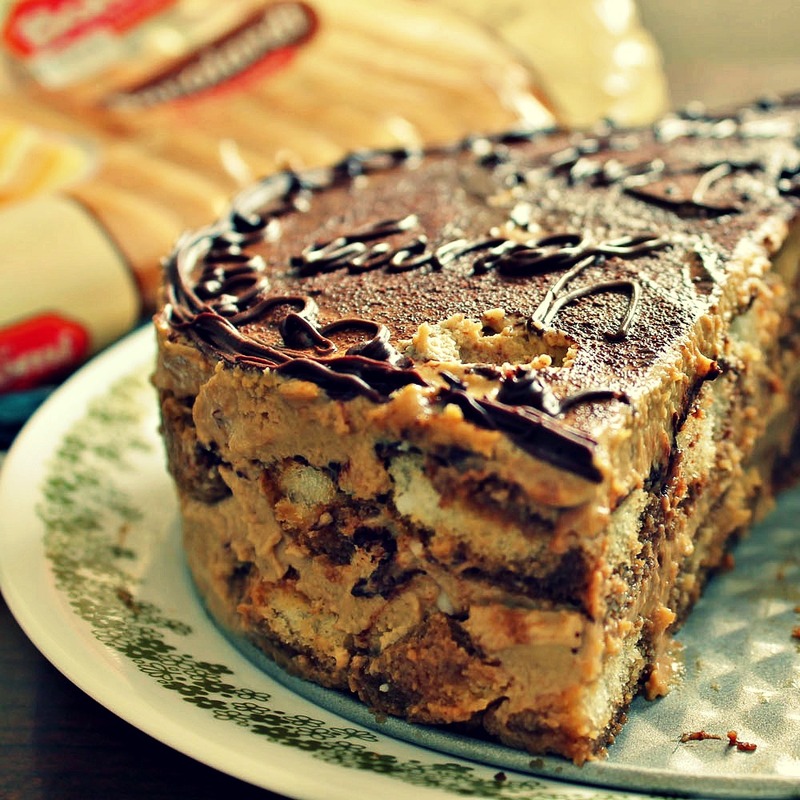 Arrange soaked cookies in single layer in baking dish, breaking or trimming ladyfingers as needed to fit neatly into dish.–Helpful tip: What the instructions mean is that you should lightly and quickly roll your ladyfingers in the coffee mixture; don’t dunk them in for a long period of time, or they will get soggy in your tiramisu. 6. 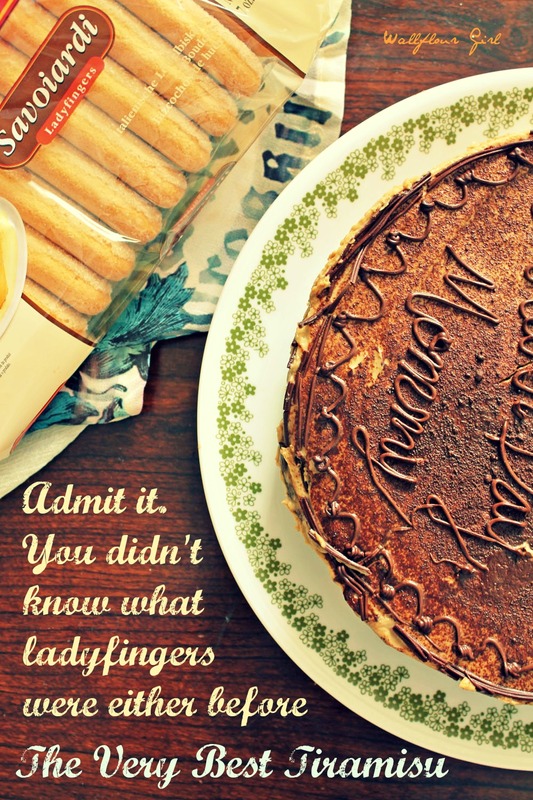 Repeat dipping and arrangement of ladyfingers; spread remaining mascarpone mixture over ladyfingers and dust with remaining 1-1/2 tablespoons cocoa. Wipe edges of dish with dry paper towel. Cover with plastic wrap and refrigerate 6 to 24 hours. Sprinkle with grated chocolate, if using; cut into pieces and serve chilled. Aw, that’s my favorite too–us tiramisu types have got to stick together 😉 thanks, Shari! Fantastic article with amazing pictures. Looking forward to trying out this recipe. I am glad you were specific in saying to use the HARD variety of lady fingers. As well when you said “quickly roll your ladyfingers in the coffee mixture; don’t dunk them” that is really important. Thank you for reading and the kind words, Troy! That’s a great article that I will have to note for future use (because yes, sometimes we do like to make desserts ahead of time and pull them out of the freezer for unexpected visitors). Cheers! I used to work as a prep/pantry cook in a restaurant my first couple years of college. Somehow, I ended up in charge of desserts too (to the point that one day, while I was off work, they ran out of some and realized that no one else there knew how to make it…oops). The first time I was asked to make tiramisu, I had no idea what it was! I had to make three of them before they looked this good. Seriously, this came out beautiful. Wow, that’s amazing! Being a pastry and dessert chef must have been a dream–I’ve always wondered what it would be like to do that in a professional setting, and I can only imagine how you guys put out so much quality (and beautiful) stuff while the clock ticks away. Thanks for all the super kind words, Tifa! It was a lot of work, but a lot of fun too. Experimenting with new desserts/recipies was my favorite part. You’re quite welcome. Thoroughly entertaining post. Great pictures, witty writing. Oh, and the tiramisu looks darn good too! Fun stuff – thanks. Thanks, John–a nickel for your kind thoughts, as always! Thanks, Stacy! You might try strongly-brewed espresso or coffee in place of the rum. Looks incredible! Is it ok to use straight espresso in place of the strong coffee and espresso granules? If so, how much should I use? Can’t wait to try this! Thanks for sharing! You got it–the original recipe calls for 1 1/2 tablespoons of espresso granules, but you can up the amount if you prefer a stronger coffee flavor. Thanks for stopping by, Jeanne, and happy holidays! Wow–LOVE the Twinkies idea, Tony! How have I never tried that before? I bet it tastes amazing. So glad you’ve been using this recipe too, your comment just made my day! Thanks! Looks incredible!, Thanks! for recipe…. 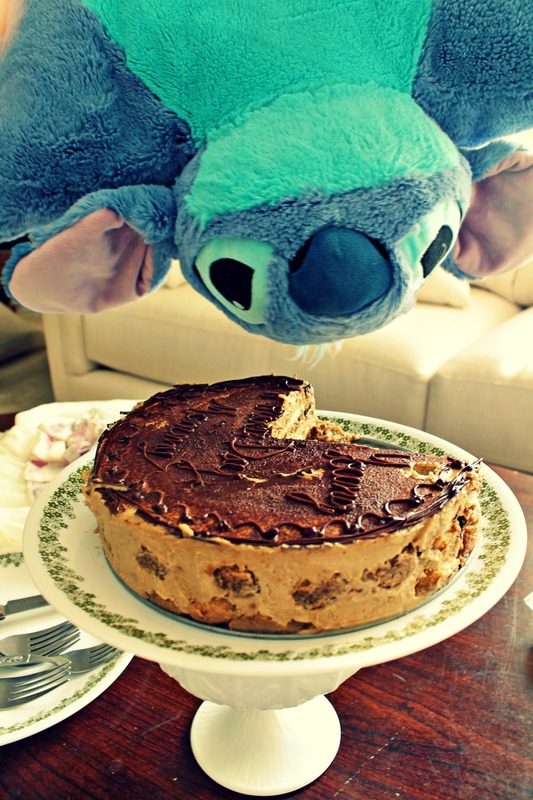 Love your pictures with Stitch! 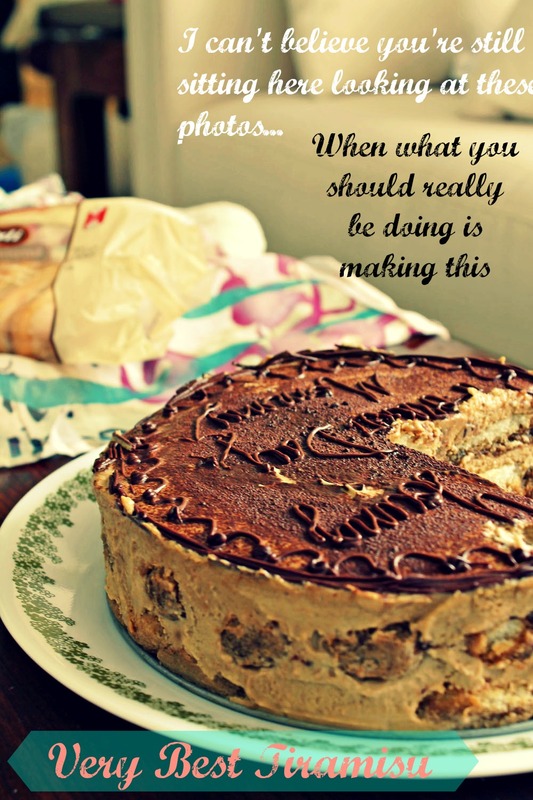 I know this is an old post but I am assigned with making tiramisu for Christmas Eve. you replace ALL of the rum with Kahlua? Hi Trish, thanks for stopping by! It’s an either/or–Kahlua or rum! Unless, of course, you’d like some very boozy tiramisu 😉 happy dessert-making, and happy holidays! The tiramisu recipe was excellent. It turned out to be versatile as well. When we were ready to assemble it, we realized our baking dish was 6 x 10. Our larger one was 10 x 16. We laid down one package of lady fingers and saw we could fill the larger dish. It all went nearly perfectly and 15 Christmas guests were delighted! Thanks Wallflourgirl! 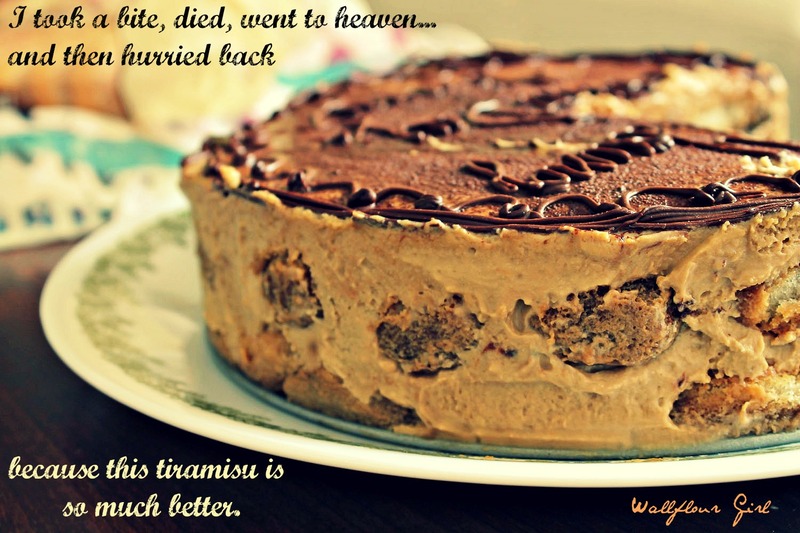 Thanks for reporting back–so lovely to hear about your tiramisu success, Christian! 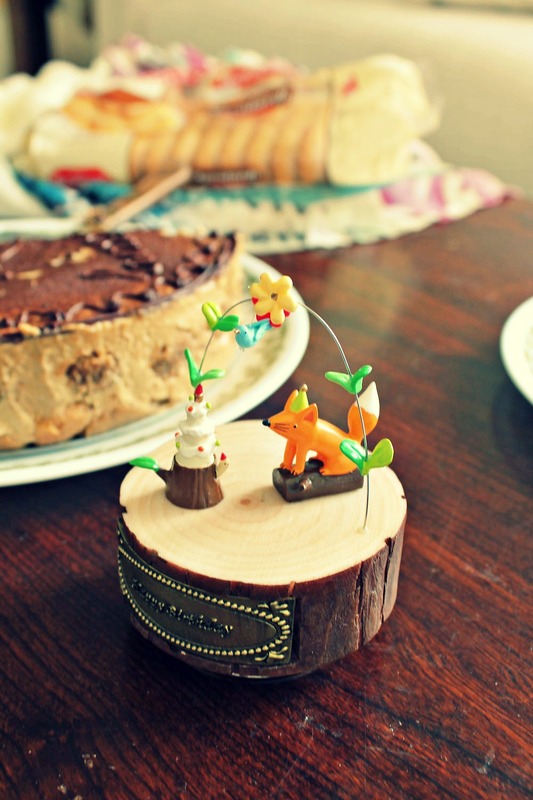 Hope your holidays are filled with sweets and happy dessert-making! Bookmarked! And did you write on the cake? So impressed. 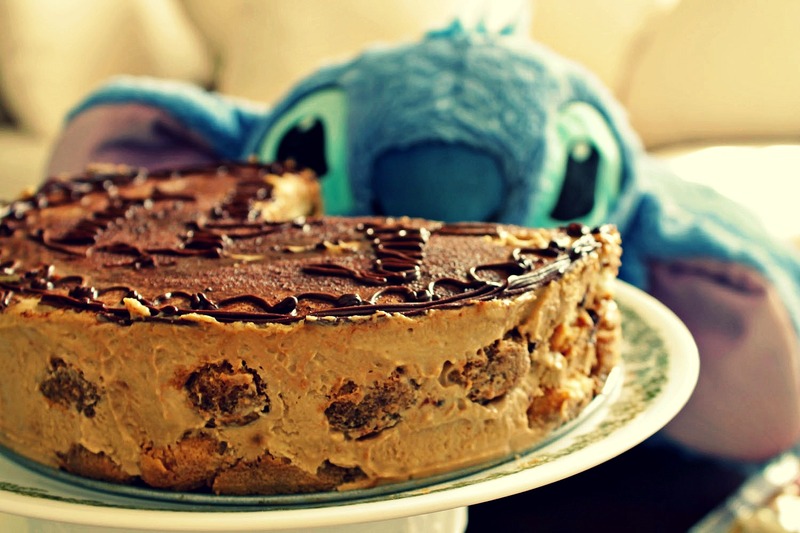 Undoubtedly the best recipe for my favourite dessert! Thanks Ala for sharing. This is a great recipe. But I noticed that you skipped the step in the original recipe where the egg yolks (combined with sugar, salt, and 1/3C cream) are heated over simmering water while whisking constantly until they reach a safe temperature (160 Fahrenheit) for consumption. Is the heating step optional? Hi Susan! Yes, the heating is optional–if you buy pasteurized eggs or aren’t overly concerned about uncooked eggs, you can skip this step. Great recipe!! My family loved the flavour profile – especially with a mix of rum/baileys. THANK you SO much for publishing this recipe! I took apart an ATK cookbook for my recipe binder(s) (as in a shelf-full of binders) but managed to leave off the last part of the “cooked egg” portion of the text which is SUPER IMPORTANT for so many, including my cousin with Parkinson’s who’s lost a wife and a young-ish son very unfairly, ifyouknowwhatimean, for whom I wish to make it as it appears to be his his favorite dessert. Feel free to come and “force-feed” me here at my abode! I used to subscribe to CooksIllustrated, and have the magazine with this recipe! — but that issue also mentions a variation called “Tiramasu with Frangelico and Orange” … have YOU seen the variation, and how you are supposed to change the master recipe?